The mere mention of Bali conjures up thoughts of heaven on earth, from towering volcanoes wrapped in a verdant canopy, to sandy white beaches that fade into the crystal turquoise waters of the Indian Ocean, to its curving coastlines dotted with staggered pagodas. It’s no wonder Bali is referred to as “Island of the Gods.” From scenic rice paddies and ancient monumental temples in Ubud, to the cliffside luxury resorts in Uluwatu, Bali is so much more than a feast for the senses; it’s a tropical state of mind and a place of pure bliss. The essence of Bali is most exemplified in the actual center, the heart of Bali – in Ubud, where culture and nature coexist in harmony amidst some of the most beautiful landscapes one could imagine. 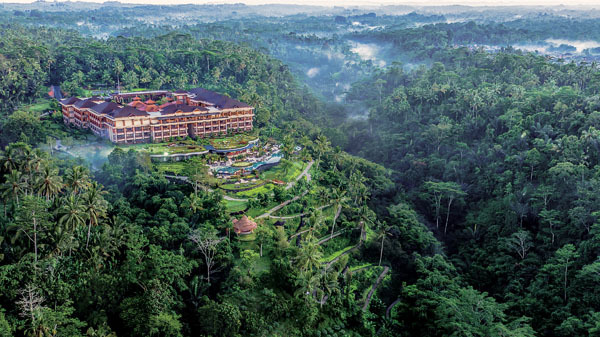 Here, ensconced in the island’s most spectacular rice paddies, bamboo forests, and river valley, The Padma Resort Ubud is a hidden gem situated in the more remote province of Payangan. The drive alone is a journey, through winding roads surrounded by lush greenery, until you reach this newly constructed resort which was perfectly designed to reflect and showcase the grandness and beauty of its natural surroundings. It is the ideal balance of pure Balinese spirit and charm fused with all the modern amenities you would expect at a five-star destination. The 149 rooms and suites are as elegant as the common spaces and are strategically positioned to take full advantage of the panoramic views. Decorated in a traditional Balinese style, the ambiance created is warm yet modern and elegant. All rooms are extremely spacious and some boast private terraces. The Premier Club Rooms offer exclusive Club Access to the Wine Lounge where you can enjoy afternoon tea and evening cocktails while enjoying amazing views of the lush bamboo forest and Mount Agung in the distance. 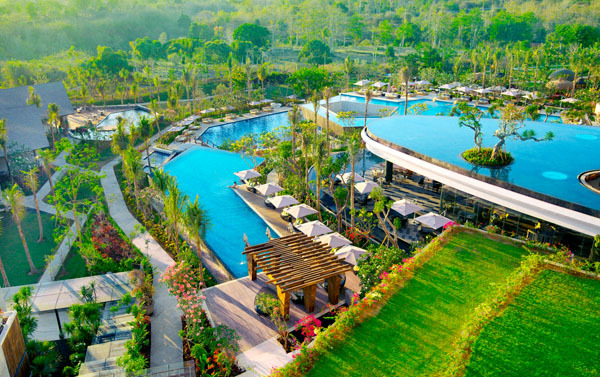 The resort is fully equipped with everything you can imagine, including an animal garden, a sunken pool bar, spa and fitness facilities, as well as one of the most impressive and longest infinity pools in Bali. Laze on the comfortable sun beds by this extraordinary pool overlooking the tropical jungle paradise below, or enjoy a walk along the mile long Jogging Track, complete with a bamboo bridge and river views. The resort also offers many complimentary activities which change daily and include sunrise and sunset yoga classes, guided bike rides, village visits, scavenger hunts, and more. If all the day’s activities have opened up your appetite, Padma Resort offers fresh and delectable dining options from The Pool Cafe & Bar, and its main restaurant, The Puhu Restaurant & Lounge, which features an international menu of exquisite dishes, including Indonesian, Asian and European specialties. Savor your meal as you take in the breath-taking views of the grounds and gardens, terraced rice-fields and even Sanur Bay, on clear days. 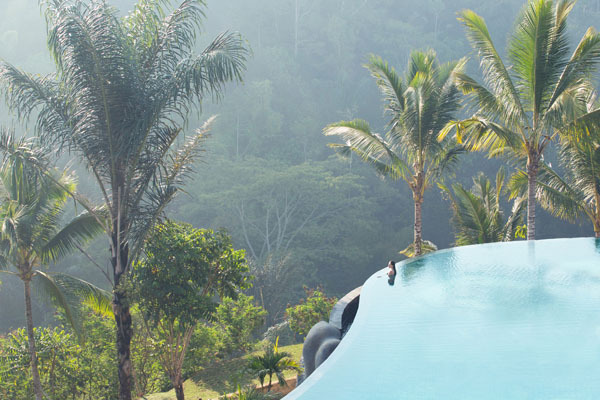 Padma Resort Ubud proves to be a true oasis of beauty, tranquility, and relaxation. After several days discovering Ubud, a drive down to Jimbaran on Bali’s southwestern coast is a must. Noted for its famed Jimbaran Bay, white sand beaches, and spectacular sunsets and seafood, it is a wonderland dotted with secluded spots and extravagant resorts. In addition to these beaches, further inland you can also find hidden treasures and amazing properties under a canopy of leafy tropical forests. One such resort, RIMBA Jimbaran Bali by AYANA, appropriately named after ‘forest’ in Indonesian, showcases 22 acres of lush gardens and is a part of the larger award-winning AYANA Resort and Spa which spreads over 200 acres with a mesmerizing coastline, and even its own secluded private beach. The facilities at RIMBA alone are praise-worthy, yet as a guest of AYANA, RIMBA, or The Villas, you also have full access to all the complex facilities which include 19 unique restaurants and bars, including the famous Rock Bar, and 12 swimming pools with spectacular views that are a photographer’s dream. And if that was not impressive enough, the property also has scenic walkways and a jogging track, along with a golf-putting course, if you would like to enjoy the great outdoors. Your time spent at RIMBA can be one filled with adventure and entertainment or a tranquil and relaxing experience. Spend your days exploring the grounds and impeccably designed pools like Unique pool at RIMBA or take the cliffside inclinator down to the exclusive private beach, home to the brand new Kuta-styled Kuba Beach Club, just recently opened in June. Soak up the sun on an ocean-facing cabana, de-stress with an oil massage, or simply sit back and enjoy some freshly prepared local comfort food and cocktails.You can also participate in one of the many offered activities like concocting your own fragrance at AYANA’s on-site perfume-making studio or learn more about Balinese culture and arts with a cultural lesson, like batik-making. 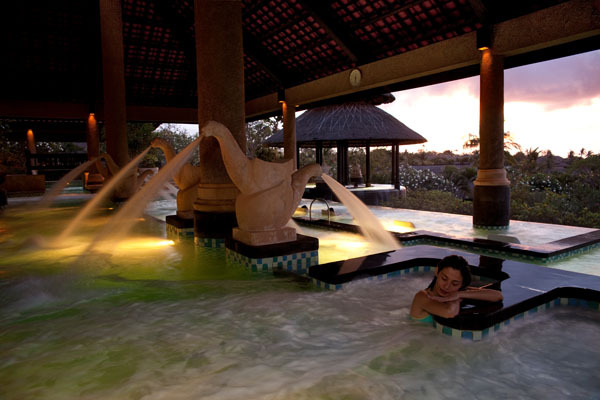 For wellness aficionados, RIMBA and AYANA are an ideal paradise to luxuriate and get pampered. From yoga classes to treatments at their award-winning Thermes Marins Spa, your body and mind will feel more balanced and nourished. The treatment rooms boast spectacular views both at the AYANA center and at RIMBA’s rooftop. Be sure to also visit the world’s largest Aquatonic Seawater Therapy Pool for full body relaxation and complete healing. 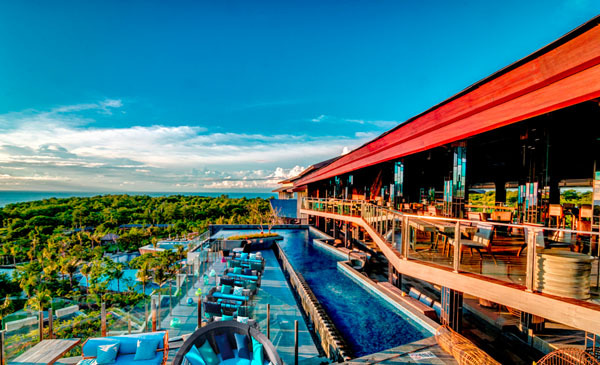 With five enchanting dining venues at RIMBA, there are options for even the most discerning palates, ranging from international cuisines and crowd favorites like Ah Yat Abalone Seafood Restaurant, to modern Mexican at the glamorous UNIQUE Rooftop Bar & Restaurant. One of the resort’s highlights fuses delectable dining and entertainment at Kampoeng Bali which was designed to take you back in time to an authentic Balinese village set along a remarkable lake surrounded by lush rice paddies while enjoying theatrical Kecak performances and savory dishes. Regardless of how you spend your days at this magnificent and exclusive refuge, your time here will be a most memorable one. 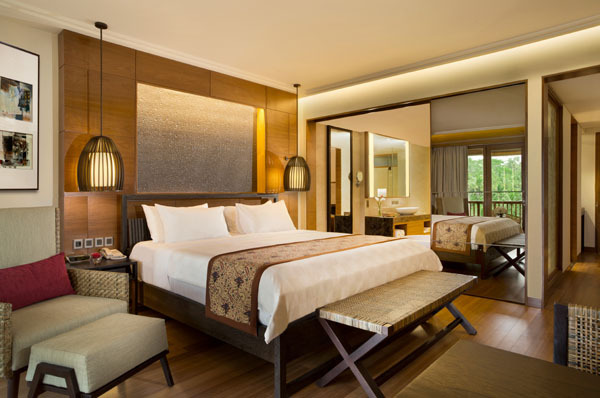 From its first-rate service, modern and well-appointed 403 guest rooms and suites, to its myriad of wellness, dining and entertainment options, set in one of the most picturesque parts of the island, a stay at RIMBA Jimbaran Bali will leave you wanting more. Continuing south down the coast to Uluwatu, a more remote and less populated area on the Bukit peninsula, you will experience yet another side of Bali; a more laid-back vibe with even more splendid views of magnificent sunsets and resorts perched on towering cliffs overlooking the expansive Indian Ocean. 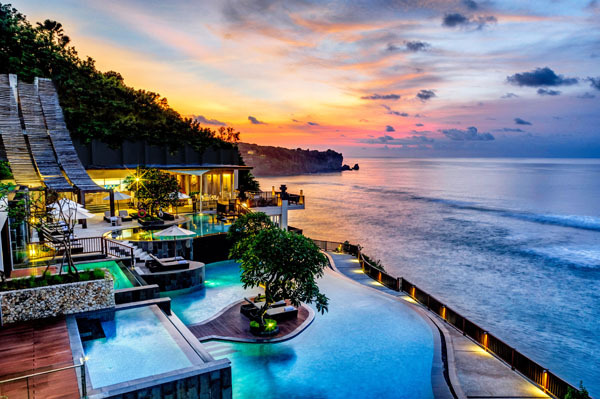 Famed for its luxury cliff-top resorts and villas, this hilly limestone region is home to Anantara Uluwatu – a true fusion of modern luxury and unspoiled natural beauty. 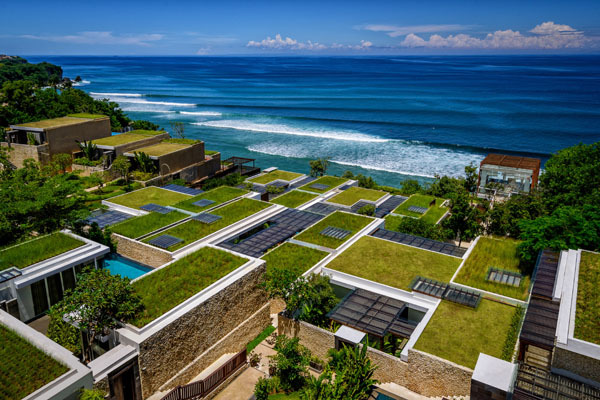 Built into the cliff over Impossible Beach, Anantara Uluwatu is an incredible and ingenious design. Its 74 luxurious suites, pool villas, and duplex penthouses are ideally tiered to optimize its panoramic vistas. While you can indulge in all the modern amenities of a five-star resort, Anantara also blends into the rugged cliffside so that you can feel connected to your stunning surroundings. The public spaces and rooms are decorated and designed in a modern minimalist style yet also feel inviting and comfortable. The rooms are very spacious, starting at a generous 904 square feet, and feature sleek interiors, complete with hand-cut marble floors, carved Indonesian hardwoods and modern furnishings adorned with more traditional local accessories and artwork. Wide balconies, terrace plunge pools, and floor-to-ceiling glass windows allow you to fully capture Anantara’s prized views. 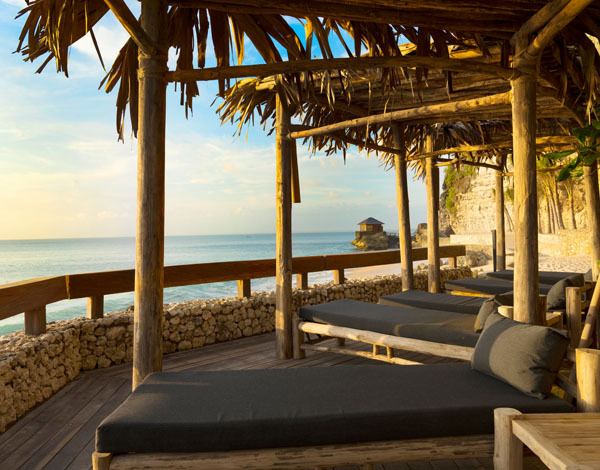 With such exquisite accommodations, you may not want to leave your room, however the cliff-edge level infinity pool is good enough reason to venture out to explore the rest of the resort. Anantara also offers wellness programs like the Balance Holistic Experience which incorporates yoga, tai chi, and other healthy and holistic activities that can be tailored into a personal program. You can also get pampered at Anantara Spa, where signature rituals are inspired by Indonesia’s Spice Islands and will leave you feeling renewed and rebalanced. Discover local attractions like Uluwatu’s famous seaside temple which is a short drive away, or take a complimentary transfer to Padang Padang Beach. Surfers can catch the amazing waves below, while adventure seekers can organize excursions like elephant safaris and trekking with the accommodating concierge. Before the day is over, head to Splash for a sundowner or dine at the main restaurant, 360, perfectly named for its all-around views from the highest point of the resort. The creative menu features international and Asian specialties, including an assortment of tasty local dishes and a teppanyaki bar. Perfect for romance, Anantara also features a unique glass chapel overlooking the sea for a memorable beach wedding. From brilliant dining experiences to amazing hospitality and design, this luxe hideaway will delight your senses in every possible way.